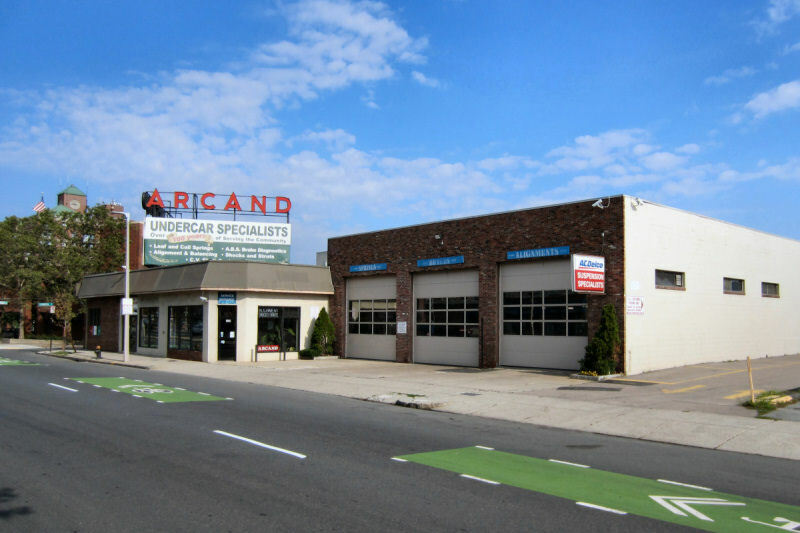 ARCAND SALES AND SERVICE, INC.
Our company was established in 1908. 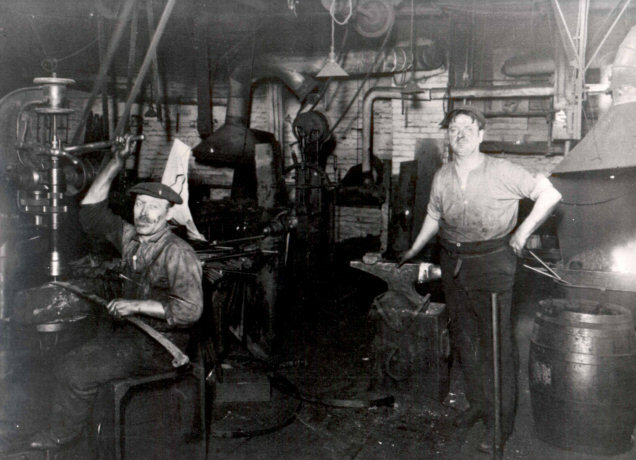 Back then we were primarily a blacksmith shop specializing in springs and suspensions on Carriages and Coaches. We worked on any transport vehicle, motorized or horse drawn. Our founder, Mr. George Arcand, Sr. and on the right in the above picture, had worked for some time with a Mr. Fisher in Amesbury, Massachusetts. This was prior to going out on his own and starting Arcand Spring Company. Mr. Fisher designed and manufactured carriage, automobile and truck frames. Mr. Fisher relocated to Detroit and his frames became the Chassis's that General Motors built their vehicles around. You may recall seeing "Body by Fisher" on a General Motors product door sill plate. Mr. Arcand died in 1918 along with over 40 million victims of the worldwide flu pandemic. His wife, Rosabla, was left with seven children. She and her oldest son Ed kept the business running at its original location near where the Prudential Tower is today. In 1920, the two decided to move out west to Allston. They purchased the site at 229 Brighton Avenue and built the original building which is in use today. That didn't stop the Mother / Son Team. They opened four more locations in the 1920's and 1930's.They were in Charlestown, South Boston, Providence, R.I. and at 50 North Beacon St. in Allston. When World War II started and so many men were enlisting in the armed services, a few branches were forced to close do to a labor shortage. The Allston and Providence locations continued on. In the late 1950's the Providence Location was sold by the family. Our current management team came on board in the 1970's and 1980's. Dan Arcand started in 1972, Bill Head started in 1975 and Bob Giampa started in 1985. Our business concentration has been in the Greater Boston Community. We repair individual, commercial and municipal vehicles. When the automobile and truck rapidly took over as our way of transport, we expanded into all related areas of repair. These areas include brake repair, alignment and balancing of all axles and installation of accessory parts that complement a vehicle's usefulness. Our company has experienced the good and bad times. We have survived two World Wars and the Great Depression of the 1930&apos;s. How? We accomplished this by having hard working dedicated employees that strive to meet the customer's needs. 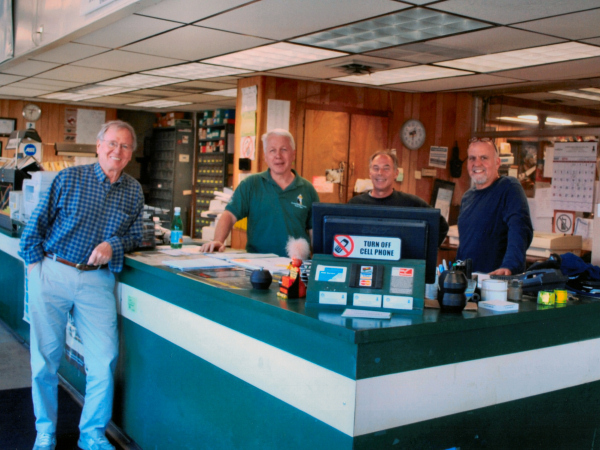 To this day, our employees continue this dedication and our philosophy remains; "The customer comes first". When the 1950's and 1960's arrived we took on new challenges with new product lines such as power lift gates, aerial towers / bucket trucks and snow plows. We continued to expand our knowledge on the new suspension and brake systems that were evolving. Our concentrations were on the new foreign technology as well as domestic autos and trucks. In 1975 we expanded our facility and doubled our size. This enabled us to perform repairs on any size over the road vehicle produced in the world today. Our part's department expanded as well and currently delivers spring, brake and suspension parts throughout New England and the forty-eight states. When the 1990's arrived, vehicle repairs were more dependent on having the latest high tech equipment at our disposal. We made the commitment and investment to stay on top of all technological advances that are introduced into our industry. This commitment enables us to repair a customer's vehicle properly and in a timely manner. Now, as we are passing through our 100th year in business and repairing vehicles requires even a higher degree of knowledge, we have made the investment in the latest computer equipment and technician training to meet our customer's needs. We service any size vehicle from Mini Cooper to Ten Wheel Commercial Vehicles. We hope you will come visit us or take advantage of our excellent part's department. We want to be,"Your One Stop Suspension and Brake Shop"
Copyright © 1997 - 2019, Suspension Specialists Co., Inc. All Rights Reserved.